KALAMAZOO -- They are beautiful, but hazardous. 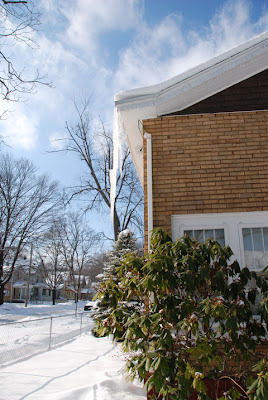 Ice dams, frozen waterfalls, flow from the eaves of many homes in downtown Kalamazoo. A walk through the streets on Kalamazoo's north side or down Axtell or Vine streets can feel like a stroll through a sculpture garden. Large icicles, some touching the snowy ground, at all angles and colors, hang from roofs like columns lining both sides of the street. "I've knocked them down a couple of times already," said David Russell from the porch of his Vine Street home. "They come back every year."